Just when you thought Skylanders had reached the end of its days, BAM, another gets announced. 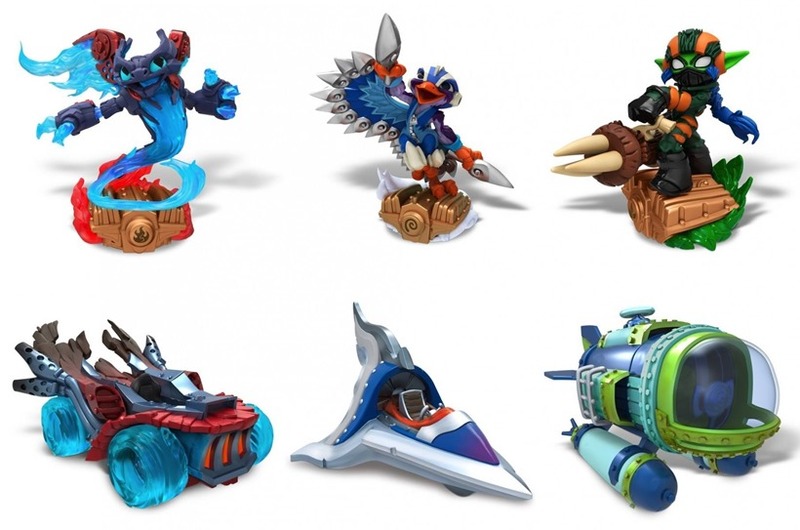 Skylanders SuperChargers is coming, much to the dismay of parents around the world. Though, truth be told, they are probably just as addicted to the series as their kids are, and likely equally excited to get their hands on the latest game. The latest iteration of Activision’s (money printing) franchise will feature vehicle figures for the first time. I got some hands on time with most of them at Gamescom, both physically and digitally. SuperChargers has all sorts of vehicle collectibles. There are cars, helicopters, boats, and everything inbetween. There’s no denying that they’re all meant to be played with, and not just in-game. Why? Simply because every single vehicle has some form of moving part. The cars for example, have wheels that allow them to roll along smoothly on any flat surface. This had me vroom vrooming all over the table with one of the newest toys while a concerned Activision representative observed from a safe distance. His eyebrows disappeared even further up his forehead when I began to make rotor noises with one of the helicopters, whose blades actually spin neatly (albeit momentarily) when flicked. Point is, these are toys at the end of the day. Activision wants them to be played with, and not exist purely for viewing pleasure. 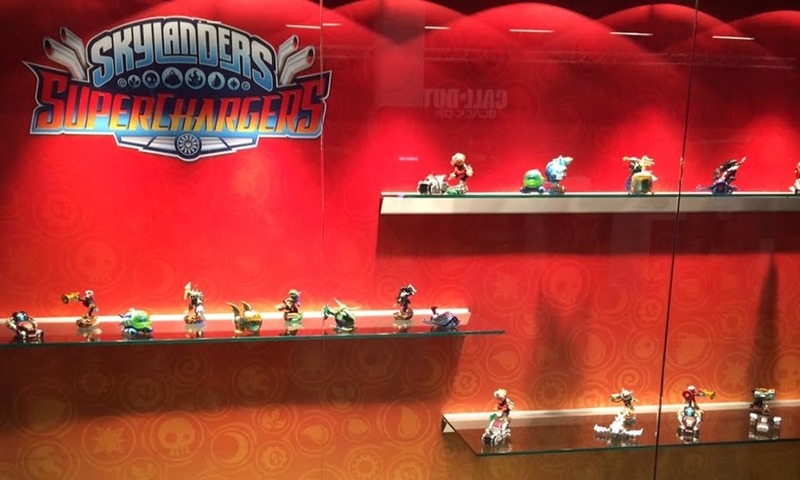 They do look great on a shelf if that’s the only reason you’re looking to buy them though. The gameplay I experienced is actually a first for the franchise. 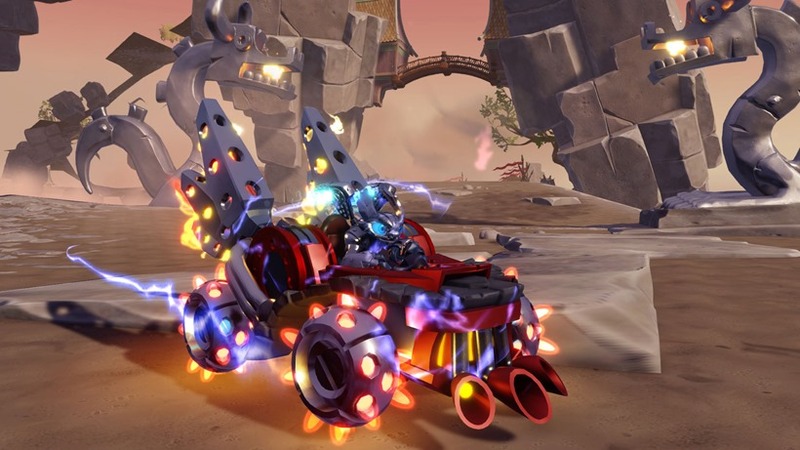 Skylanders SuperChargers will ship with a fully fledged “karting” game, independent to the single player campaign. It’ll also feature online multiplayer – another franchise first. Don’t worry, the mode will be playable offline too. Unfortunately, it’s not possible to talk about mode like this without a Mario Kart comparison taking place. SuperChargers is very similar Nintendo’s racer in many ways, but it does have a thing or two that sets it apart. For starters, there are three different environments to race through: water, ground, and air. Each feels unique in their own way. 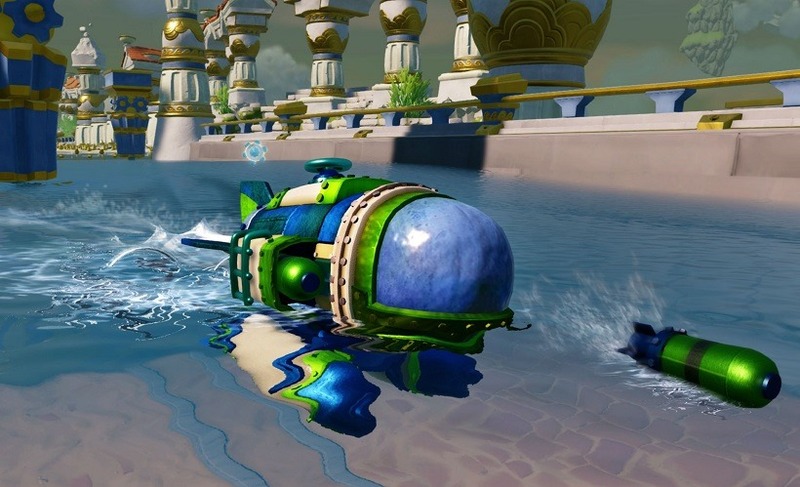 On water, each vehicle races along the surface, but can dive under with the push of the button. Doing so reveals a different side to the track, where there may be a shortcut through what appears to be a solid wall for example. 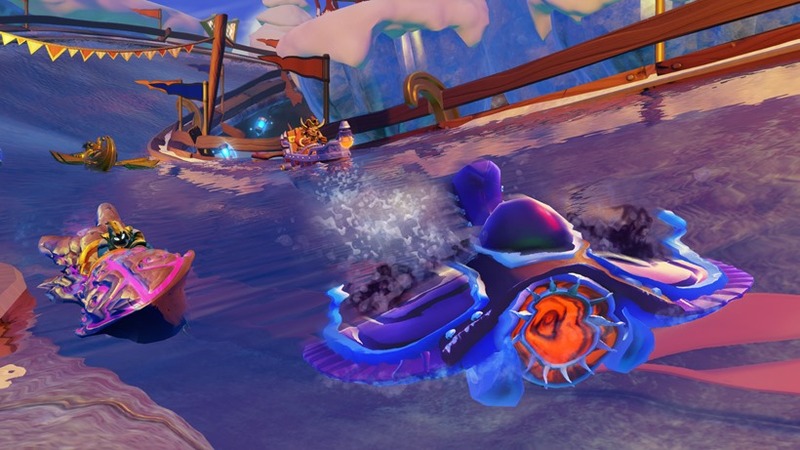 Lastly, In the air, vehicles are not stuck to a “2D track”. The skies are mostly free to fly through, though obviously it is recommended to stay on course and follow the “track”. There are a bunch of power ups too. The difference here is that all of them are automatically activated on pickup – granting bonuses such as a shield, speed boost, or other goodies that make racing a nuisance for opponents. SuperChargers definitely feels more proactive in terms of combat. Each vehicles comes with two firing modes which can be used pretty much all the time as long as there is enough energy (it replenishes fairly quickly). Shooting an enemy drains them of their hp. Draining it to zero puts them out of the race for a few vital seconds. This is where a little bit of strategy comes into the racing too. Each vehicle has different stats such as health, speed, handling, firepower, and so on. The one vehicle I flew for example, was incredibly fast and had reasonable offensive capabilities. On the downside, its health was terrible, meaning I got shot to a standstill several times – kind of negating the amazing speed stat I had. If only I were better at flying! The racing is certainly fun. During my time (in which I played at least once in each environment), I went up against three other journalists. It’s typical karting, which means holding the lead for the entire race means little in the bigger picture. All it takes to snag victory is some well placed shooting and a power up or two that’ll put the leader at the back of the pack. It happened to me once or twice, just before the finish line. I cursed, most definitely, but I did so with a smile on my face. In fact, every single one of us racing were laughing most of the time, taunting each other, and pushing hard to win. 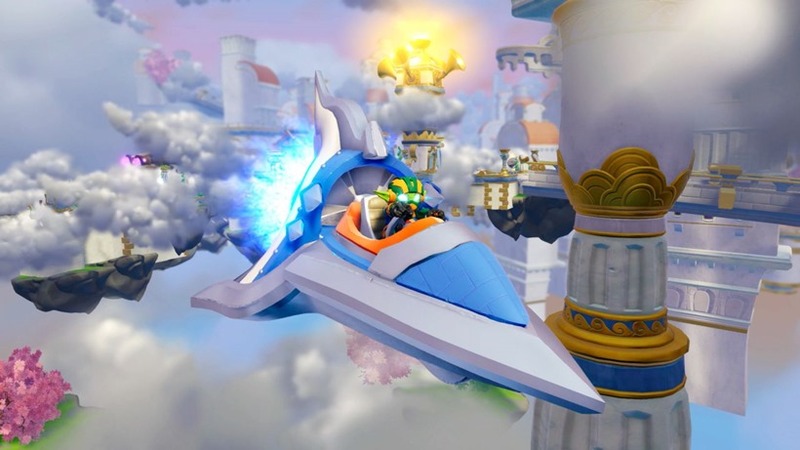 In short, the racing is a great addition to the Skylanders franchise. What’s nice is that Activision could’ve turned it into its own fully fledged title, but they haven’t. They’re bundling it all with the main SuperChargers package instead! Parents and kids alike are going to enjoy it a lot in my opinion. Parents maybe not so much, purely because their wallets are going to get considerably lighter.